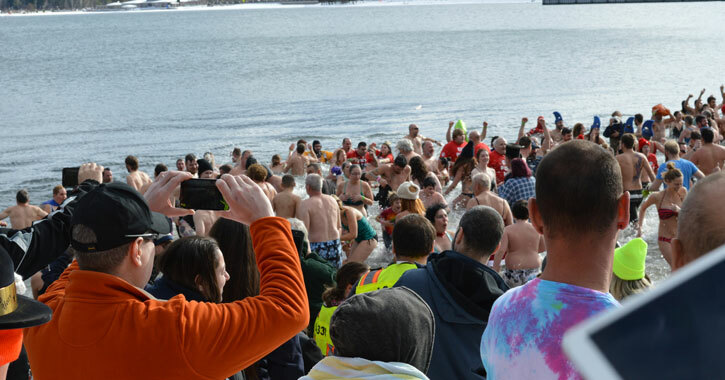 The 2019 Lake George Polar Plunge - Take a New Year's Day Swim! Every year, hundreds of people gather on the frosty shores of Lake George for a daring New Year's Day swim known as the Polar Plunge. That tradition continues this New Year's Day at Shepard Park Beach where about 1,000 or more participants are expected to take part in the Lake George Polar Plunge. The annual Lake George Polar Plunge has been a popular tradition for years, occuring on the "First Day" in Lake George. Over a thousand people crowd Shepard Park Beach in their swimming trunks and bikinis for the event, shivering and dancing around to stay warm before the countdown to the big plunge. Then, all at once, they rush into the bone-chilling waters for a New Year's polar bear swim! Shepard Park Beach is located on Canada Street in Lake George Village. The Polar Plunge always takes place on January 1st. It costs $10 to sign up, and proceeds go towards the Springfield Shriners Hospital's Acute Pediatric Rehabilitation Program and local fire department. Polar Plunge long-sleeve tee-shirts will also be available for $10. The New Year's Day Polar Plunge Party will take place at Duffy's Tavern from 1pm to 5pm with the band Spoiler. Enjoy drinks specials! For more information, contact Duffy's Tavern at 518.668.5323. Wondering what it's like? Winter in Lake George is no mild climate, so the waters are frigid and just barely above freezing temperature. In some years, there has even been a thin film of ice to swim through. It is cold! Most take the plunge and hurry back to the shore for dry land and fluffy towels, but there are others who seem to be true polar bears at heart! Surprisingly, many will actually stay in the freezing cold water and swim around a while. Whether it's merely a show for their friends or the water simply doesn't feel as cold to them, these daring swimmers take polar plunging to a whole new level! If you still have doubts about how chilly it can be, we've posted a Lake George Polar Plunge video below. You can watch the participants' reactions and listen to their excited shrieks and screams as the icy winter water stings their skin.